The last time I launched a product, I didn’t leave my house for an entire week. As funny as this story may seem, this is actually common for many people who do big product launches. … Okay, they may leave the house at least ONCE, but you get the picture! A product launch is a strategy that involves getting a large amount of sales by opening and closing the cart for a limited time (typically a week’s time) 1-2 times throughout the year. A large amount of planning and creative energy. Late nights of closing the cart. If product launches were the only way to sell a ton of courses, I would accept this as the cost of doing business. But fortunately for us, product launches are not the only way to sell your course. And most of all … with just about the same amount of profit. When I discovered this way, I swore to never put myself through another product launch again. So if you’re someone who’s tired of launching and the insane amount of hustle it involves, this way should be music to your ears. In this article, I’m going to show you the EXACT step-by-step strategy for building an evergreen course funnel. An evergreen course funnel is a strategy that allows you to sell your course everyday on autopilot, as opposed to large open and close cart launches. Now, just a word of caution … this is a meaty article (about 8,000+ words). In this article, I’m first going to show you why you might consider building an evergreen course funnel and then I’ll take you into the mechanics of how to strategically build one the smart way. Is there anything good about a product launch? Why do a product launch at all? BONUS: [thrive_2step id=’1427′]Click here[/thrive_2step] if you want my FREE master guide and project workflow template to help speed up your creation of this evergreen course funnel! Before we dig into how to build an evergreen course funnel, l want to share with you all the reasons I decided to step away from open and close cart launches. 1. Product launches depend on you putting all your eggs in one basket. You know what was one of the main reasons why I became an entrepreneur? I was terrified of having one income source. What would happen if I were to suddenly be laid off? How would my family survive? That thought alone was enough to make me an entrepreneur. Why put all your eggs in one basket? Why depend your entire business on ONE event? Now, I get as an entrepreneur you might have several income streams outside of your main product launch. But these income streams most likely pale in comparison to your main product launch. This means, a majority of your business’ revenue will only come in chunks possibly twice a year. That sounds eerily similar to putting all my hope in one big revenue stream. Don’t put all your eggs in one basket. Diversify, survive, and grow. 2. Product launches typically have unforeseen dangers you never discover until you’re in the moment. One time I did a product launch with a client and our webinar software decided to boot the 1,000+ who were attending the webinar off the broadcast. Talk about STRESS. This would’ve been redeemable if this weren’t a product launch. Only problem was, it was product launch, and we only had one shot at making this webinar work. The trouble with product launches is they almost always have unforeseen dangers that have the potential to crash the entire operation. Who wants to deal with that? 3. Repeated product launches are just plain STRESSFUL. When that webinar booted our attendees off, you know what I felt? STRESS. STRESS is the defining feature of product launches, and it’s also one of the top reasons why I hate product launches. That is why I hate repeated product launches … because if your stress is so high that others comment on it, then you’re most likely doing something wrong. 4. Big product launches force “ready-to-buy” leads to wait. Just yesterday, I had a big payment drop in my PayPal account from someone who wasn’t on my email list for 2 minutes yet. This person was ready to buy! People hungry for solutions don’t sit around and twiddle their thumbs. They either find the solution from you, or they go somewhere else with their money. Now, you could make the case for having a tripwire product that’s for sale all the time … but I like giving people the BEST answer to their problem right upfront. This means, I don’t want them to implement a lite version of what I have to offer, and have them wait for my big offer. I want them to get my big offer if they are willing to do so. 5. Final reason: if it doesn’t work, it doesn’t work. This is possibly the biggest reason why product launches don’t work for me. You could invest a ton of money and time in a new product launch strategy you believe will sell like crazy. But if it doesn’t work, then it doesn’t work. Product launches are NOT bad … they just might not be your cup of tea. I’ve seen friends make millions with their product launches. So obviously, product launches get something right. I need you to listen carefully on this one: If you plan to ditch product launches entirely, you’re wrong. Product launches get several things right. This means, we must take everything that works with product launches, and turn it into something new. 1. Product launches absolutely nail the nurture needed for a sale. Basically, people need to trust you with their money. By seeing a video of you, you overcome these trust barriers easily. Also, in order for a buying frenzy to take place, you need to build buzz for your upcoming launch. Each video foreshadows a future excitement, and keeps building up until everything blows open on launch day. And finally, people need to be educated before they buy into your solution. They need to know what they’re buying and why they’re buying it. All of this is part of the necessary nurture a lead needs to buy from you. Genius! 2. Product launches have true scarcity. An open and close cart launch—where people don’t have access to the product until you open the doors again—is the ultimate scarcity. This is why product launches can pull off massive sales in a short amount of time … because people truly won’t have access to the product again! I mean, I STILL beat myself up for not acting on some product launches out there. Now I have to wait for an entire year to get their product! Whenever you release a product, you need an element of scarcity to drive your sales. If no scarcity exists, you’re not mobilizing people who are on the fence to buy from you right then and there. In other words, you’re missing out. Open and close cart launches have the scarcity element figured out. But there are ways to overcome that in the new strategy … more on that later! 3. Product launches capture the excitement of being LIVE. There’s nothing more exciting than watching something live. It captures an energy and momentum that you can’t truly replicate in another setting. When you open the cart there’s a feeling in the air, and your potential buyers feel it! It electrifies them and pushes them to buy right then and there. But what happens if they don’t have this energy? What happens when they get the sense that this isn’t live? Well … they are less excited to buy, which means, they’ll probably buy later or not buy at all. The momentum of a live product launch creates a literal buying frenzy. If you’re going to move away from product launches, you still need a way to create momentum for your buyers … otherwise, you’re squandering your sales. If these reasons show us anything, it’s this: product launches can’t be abandoned entirely. They just need to be modified. So what is the alternative to doing big open and close cart launches? How can someone capture the momentum, scarcity, and nurture of a product launch while avoiding the hustle and stress of doing it every time? Simple. We have to take what works for live product launches and turn it into an evergreen course funnel. In other words, the alternative to doing big product launches is to create and optimize a stellar funnel to sell your course every day. We’re not entirely abandoning the traditional product launch method. We’re still going to do a product launch. We’re just going to be strategic about it and have it sell for us all the time. BONUS: [thrive_2step id=’1427′]Click here[/thrive_2step] if you want my FREE guide on how I’m able to acquire clients AND sell courses with one single marketing system. There are two very valid reasons why you should do a big product launch at least once. Before we create an evergreen course funnel, we need to test whether your course will sell with all your marketing assets. We need to test this before we put any paid traffic into your funnel. If your course doesn’t sell well organically (meaning, to traffic you own like your email list), then it won’t sell well when you put paid traffic behind it. A product launch is how we’re going to test whether your course will sell. Your course deserves to be launched. To explain this, let me tell you a story. I recently met a man who spent almost an entire decade writing a book. When he finished, it was pretty much the greatest work ever. But you know what he did with it? He didn’t go screaming about it on rooftops. Instead, he shelved it. He whispered about it to a few people. But for the most part, the world did not know about this groundbreaking book. What a tragedy. If you do not build up buzz and excitement around your course, then NO ONE will be excited to buy it. If you believe your course has the potential to make a huge impact in people’s lives, then it deserves a launch. It needs to be made into a big deal. If the world needs your course, then let’s make sure the world hears about it. So the absolute first step to creating an evergreen course funnel is to execute a product launch. If done right, this will be the ONLY time you will do a product launch. Once you execute the product launch, we’ll take all the marketing assets you created during the launch and (depending on their performance during the live launch) we’ll rearrange them so they form a stellar evergreen course funnel. The pre-launch content is typically 3 videos (popularized by Jeff Walker). These three videos pose a problem your subscribers are facing, agitates that problem, and then provides them with a solution. All of this content is delivered the week before cart opens. The earlybird phase begins the day before the cart opens. You send an email on Monday giving a preview of your course and then open your cart on Tuesday. From Tuesday to Wednesday at midnight, you would offer an incentive to promote early buying. The mid-week launch phase happens over the weekend. During this timeframe, you typically want to offer an incentive to promote buying over the lull of the weekend. Then in the close cart phase, you start bringing things in for a landing. You throw in a case study on Monday, remind people that the cart is closing the next day on Tuesday, and then close the cart on Wednesday. Your eyes are not deceiving you. A typical product launch is at least 18 emails. NOTE: during a live product launch, there are more emails that send out to different segments of your audience. This is just a broad overview of your launch, which includes critical emails to include during a live launch. For an evergreen course funnel, we’re going to cut this down significantly, so don’t worry. ANOTHER NOTE: a live product launch will also have a great upsell offer once people buy. This will come in handy for your funnel later, so keep this in mind! BONUS: [thrive_2step id=’1427′]Click here[/thrive_2step]if you want my FREE guide on how I’m able to acquire clients AND sell courses with one single marketing system. While this part might not seem as important during your live launch, it is VERY important in your evergreen course funnel. What am I talking about? The webinar that happens on the Monday night before open cart. In the evergreen course funnel, this webinar will be your main selling asset. Now, this doesn’t mean you have to get it perfect during your live launch. The only thing you have to master is your content. If the content of your webinar doesn’t amaze, you’re hurting your funnel. What I typically recommend is for a person to do a live webinar during the launch, and then re-recording it for the evergreen course funnel. Why? Because again, we want to nail this presentation. Live webinars tend to go long, but if you’re re-recording it, you can tighten the experience (more on this later). There are more things you could add to this script, but this is the barebones template I use to draft my webinars. Give them a brief bio of yourself. Introduce the big promise people will achieve by attending your webinar. State the rules of the webinar, like turn off devices or follow along in a workbook. Define the hook, which is an incentive you give to people who stay until the end of your webinar. Describe the old way of doing things (this is where your attendees are currently at most likely), and state there is a new way for achieving your big promise. Teach your content in the form of secrets and tips (ex: tip #1, tip #2, tip #3). Weave in ways your content is different from what others believe or what other teach on your subject matter. Give two options for moving forward. Typically includes something about continuing to struggle with your subject matter vs. fast-tracking success with your course. Introduce your product and state the main benefits. Say the total value of all that’s included in your course (ex: “all of this is worth $3k), and then tell your attendees what you’ll actually be charging (ex: “but for today, I’ll charge just $300). Give details about your webinar-only deal (a fast action bonus you deliver if people buy live). Answer questions people have while keeping your buy link on the screen. If you follow this script, you’ll for sure create a flawless presentation during your live launch. Now, it’s finally time to start building your evergreen course funnel. If you don’t understand this yet, don’t worry because I’m going to break down the different phases in depth. But first, let’s talk about the tools needed to start building this funnel. Before we start building out this funnel, I’m going to tell you all the tools you need and can benefit from. Here we go! Your email marketing automation software will power this funnel. The best ones I recommend are Drip (aff link), Infusionsoft, and ActiveCampaign. I personally use Drip, but have built funnels in these platforms. First, you CANNOT build this funnel in a list-based email marketing software like MailChimp or Aweber. You need powerful automation and tagging to power this funnel, and you’ll see why soon. You can build this funnel with ConvertKit and EasyWebinar, but I haven’t honestly tried that yet, so I can’t recommend it. Drip (aff link) is lightweight marketing automation that’s low-priced, and will allow you to build beautiful visual workflows. And you can start out for FREE if you have less than 100 subscribers. Infusionsoft costs an arm and a leg, and is super technical. BUT it’s crazy powerful. In my opinion, it’s still the best automation platform out there, even if it’s complicated. And ActiveCampaign is moderately priced, but is clunky in my opinion. It’ll allow you to do what you need it to do, and that’s what matters! For this funnel, we’ll have a webinar broadcast at all times of the day. This is what’s called an automated webinar (as opposed to a live webinar). In my opinion, EasyWebinar and EverWebinar (aff link) are the best at this. What really helps with these two platforms is that they allow you to segment your attendees based on the behavior they take inside the webinar. Your evergreen course funnel requires a lot of pages to be built. For the best performing landing pages, I recommend ClickFunnels. ClickFunnels will allow you to build all the pages you need for your funnel in just minutes. You can create webinar registration pages, shopping carts, sales pages, and more. Plus, they have really great split-testing if you’re into that stuff. Alternatively, you can build all the landing pages you need inside of your website. But if you’re looking for some ready to use templates that are optimized for conversions, my vote is ClickFunnels. Zapier allows your different apps to speak to each other, which will automate your funnel and help you do less. It’s been absolutely critical in linking together the different apps for my funnel. For instance, when a purchase is made in your online course platform, you can use Zapier to tag that customer in your email marketing provider. This is vital for the success of your funnel. For this funnel, you will have to record a webinar presentation and edit it down to perfection. I do this using Screenflow, which allows you to record screen capture, and edit your recorded video. If you’re using a Mac, use Screenflow. If you’re using a PC, use Camtasia. You need scarcity and urgency for your course to sell. You do this by having your offer expire after a certain time. But how can you do this? Easy. With Deadline Funnel, you can incorporate countdown timers and redirects into your funnel. So when you say you only have 5 days to claim an offer, you mean it. I am a copywriter who writes a TON of copy. I do all of my copywriting in Google Docs. Why? Because I like how easy it is to share with others, and I like having all my copy in the cloud. For this funnel, you’ll be writing a lot of copy. I recommend using Google Docs for this copy! I use Google Slides for my presentations. Why? Again, because I like the cloud. But for this funnel, you’ll need to record a slidedeck, so you’ll need a software like Keynote, Powerpoint, or Google Slides to get the job done. Now, I’m writing this from the perspective that you already have an online course to sell. But if you don’t, then you need a platform to host your online course. I recommend using something like Thinkific (aff link) or Teachable to host your online course. They’re simple to setup, and handle all the nitty-gritty details of selling a course online with ease. Alright, we’re ready to build your evergreen course funnel! But word of warning: this is NOT something you can build quickly. It will require time and patience. Follow these instructions, and you’ll have the ultimate selling asset for your online course. Now, in our evergreen course funnel, your webinar will be at the top of the funnel—meaning, your webinar comes first. You’re probably wondering … how does my webinar come first? Does this mean I have to do a live webinar every day? We’re trying to make life easy for you with this funnel. Instead, we’ll be turning your live webinar into an automated webinar. This means, your webinar will broadcast to your attendee at the time they choose. So if they choose to watch a webinar at 1pm tomorrow, the webinar will automatically start up for them at that time, as if you’re doing it live. So the first step to creating an evergreen course funnel is to build your automated webinar. You’ll be reusing the content from the webinar you did during your live launch. But I DON’T recommend using the exact same recording from your live launch. Why? Because in my experience, webinar done during live launches tend to go long. This is okay when you’re speaking to your own audience because they’re your fans, so they’ll stick around when your webinar goes long. But if we’re rearranging the funnel so your webinar comes first, then you need to cut to the chase a lot faster. I recommend using the same content, but re-recording different parts of your webinar to tighten the experience. You can easily re-record and splice together an edited version of your webinar using Screenflow. It’s my number one tool for screen capture, editing, and recording. 1. Never mention the date or time. While you might mention important dates in your live launch (like open cart and close cart), do NOT do this in your evergreen version. Why? Because the moment you mention something that doesn’t fit with where your attendee is at, you break the experience. Our goal is to simulate a live experience as much as possible. This means, never giving any time reference. 2. Never mention that your webinar is LIVE. Be honest. Your webinar is not live, so don’t say it is. If your attendee discovers that it’s not live after you specifically say it is, it’ll leave a bad taste in their mouth. Remember, with the evergreen course funnel, your webinar is going to be the first interaction your subscribers have with you. You’ll start the relationship off on the wrong not if you lie to them. 3. Answer the same questions from the live launch webinar. Answering questions are important in a webinar because it’s how you overcome the objections your attendees may have. So even though you aren’t answering questions live, you should still answer questions. And then transition into answering the questions. 4. Use scarcity to drive sales, just as you would in a live launch webinar. Implementing scarcity in a live launch webinar is simple. All you have to do is end the fast-action bonus offer at the end of the live webinar. But since people will be coming into this webinar at different times, how can you implement scarcity? Use a program like Drip (aff link), Infusionsoft, or Active Campaign to expire the offer for you. In Infusionsoft, you can actually expire the page people buy from when the webinar ends. In Drip and ActiveCampaign, you have to get a little fancy. You can integrate with tools like Deadline Funnel (my personal fave), and have Deadline Funnel expire the page with the special deal. Now that you have a finished recording of your webinar, it’s time to plug that sucker in an automated webinar tool. My two favorites are EasyWebinar and EverWebinar. With EasyWebinar and EverWebinar, you can create your first evergreen webinar in just minutes. Plus, you can segment your attendees based on the behaviors they take during your webinar. This will be KEY for building out the rest of your evergreen course funnel. 1. Set your webinar to either broadcast every day or on the following day. In both EasyWebinar and EverWebinar, you have the option to choose the frequency of your event (how many times it’ll broadcast, and at what times). If you look closely on both screens, you’ll see there is a “just in time” registration option. What this means is, EverWebinar and EasyWebinar will display the next available broadcast as happening in the next 15 to 60 minutes from the time a person arrives on the registration page. On both screens, I’ve set the “just in time” option to happen in the next 30 minutes. So a new broadcast will start every 30 minutes. NOW, here’s the catch … I don’t recommend this for all webinars. If you have a high-ticket product (~$1,000 dollars), then give people a day between the time they register and the time they watch. If you have a lower priced product (~$100-$500), then enable “just in time” registration. The reason I do this is, for higher priced products, I want there to be a bit more nurture. So I will create a show-up sequence (the emails your registrants get to prioritize attendance to the webinar) that will do the job of both making sure someone attends AND educating them on why they need a solution to their problem fast. For a lower priced product, I don’t include so much nurture beforehand. Instead, I just let the webinar do its job. 2. Put your show-up emails in the webinar software. Your show-up emails are the emails your registrants get to help prioritize attendance to the webinar. I would put those emails in your webinar app so they deliver depending on the time of the broadcast. These emails can be the same emails you used to prioritize attendance during your live launch webinar. But I would typically have them follow this time schedule. Your registrant won’t get all of these emails depending on the time of their broadcast. If they did a “just in time” option, they would only get the last email. But if you set your webinar to broadcast a day later, they would get all the emails. Again, set these up to send through your webinar app. 3. Make sure your call-to-action buttons lead to the right pages. In EasyWebinar and EverWebinar, you can have timed CTA buttons that pop up during your presentation. So when you deliver your offer in the presentation, you should have BUY NOW button pop up. An offer button in EasyWebinar! Your CTA in the webinar should lead to a short-form sales page where your buy button is close to the top of the page. Here’s why: if people are clicking through from your webinar, they’re hot leads who are ready to buy. They don’t need to read your long-form sales page because they don’t need to be sold on your product. They’ve already decided they want to buy. The buy now button or pricing table close to the top of the page. Objections and FAQ underneath this pricing table. A money-back guarantee listed somewhere on the page. That’s all you need for a webinar sales page. You don’t need long copy to nurture the leads who are clicking through from your webinar. 4. Segment your attendees based on their behavior. This is the most important part of your webinar setup because this will determine how the rest of your sequence plays out. In both EasyWebinar and EverWebinar, you have the option of segmenting your audience in your email marketing automation app (like Infusionsoft or Drip) based on the actions they take during the webinar. People who show up, but leave early (before your offer). People who see the offer. If people don’t show up OR leave before the offer, we want to nurture them more. If people see the offer, but don’t take action, we want them to follow-up with them to give them time to decide. I’ll explain this more in-depth in a later section. You might be scared by this headline because you remember all the writing you had to do for your product launch. To make our evergreen course funnel, we’re going to reuse the SAME emails you wrote for your product launch, with the exception of your replay emails. Again, this is why it’s so important to segment your webinar attendees. If you don’t know who missed the webinar or left early, then you won’t know who to send the replay emails to. Now, to answer the question you’re probably thinking … why don’t we send the replay to those who attended and saw the offer? They’ll get the replay, just in a different email 🙂 More on that later. That is your replay emails in a nutshell. The goal of these emails is to give one chance for people to watch the presentation. Next are your Bridge Emails. Your Bridge Emails build buzz and excitement for your launch by providing the nurture needed for a sale. So can you guess what your Bridge Emails are going to be? If you guessed your Pre-Launch Content (the 3 videos and emails you wrote during your live launch, you are absolutely correct!). So you should already have these emails written from your live launch. Next up is your Launch Emails. These emails are the ones you sent when your cart was open. But first, I want you to know something: we’re going to drastically cut down the emails you send during your launch sequence. You’re not going to send a bajillion emails like you did during your live launch. That’s right—we’re cutting away all the bonuses and special deals with your evergreen course funnel. The reason is, setting up bonus deliveries complicates your setup. Plus, we want to shorten the timeframe of your launch sequence so they only get pitched to for 5 days. This is a short and sweet launch sequence. As you can see, we’re adding an email where you’ll give testimonials about your course, or share your own story in developing this course (if you don’t have testimonials). We’ll also be adding a Packages email, where you’ll talk about the different packages to your course (if there are some). If you don’t have packages you want to highlight, then I would make this email your FAQ email. The launch period will only be open for 5 days. Again, you’re pretty much re-using the emails from your live product launch. Now that your emails are all written out, it’s time to automate their delivery in your favorite autoresponder! Remember, this autoresponder has to allow segmentation from your webinar software—meaning, you have to be able to track the behavior of your attendees and tag them accordingly in your email marketing platform. The best email marketing platforms for this are Drip, Infusionsoft, and ActiveCampaign. If you’re using EasyWebinar, I recommend using Drip. If you’re using EverWebinar, use Infusionsoft or ActiveCampaign. To explain this: only people who see the offer from your webinar will progress to your launch sequence immediately. If people did not see your webinar or left before the offer was given, we’re going to assume they need more nurture. That’s why we’re bringing them through the Bridge Emails before we launch to them. Remember, live product launches absolutely nail the nurture needed for a sale. In your evergreen course funnel, we’re setting it up so that only the people who need nurture get sent the Bridge Emails. If people saw the offer, but didn’t buy, we’re sending the Launch Emails because we’re assuming they need more time to decide. After all, it’s hard to jump on a webinar with someone you just met, and buy their high-price product within an hour. With the Launch Emails, we’re giving them time to talk with their spouse, refer to their budget, and determine whether your offer will be good for them. If you’re unsure how to set up this automation, I recommend hiring a consultant who knows what they’re doing. This setup will make you a lot of cash, so you want to invest in it. 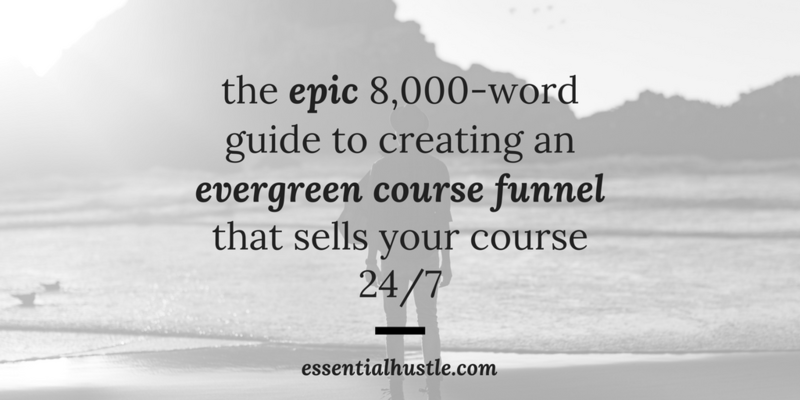 Do you know what really makes evergreen course funnels successful? An upsell is when you, the seller, promote a more expensive offer, upgrade, or add-on, to make a greater profit from a customer. How this traditionally happens is, a person buys your course, and then you offer a one-click upsell on the next page. One-click upsells are upsells that can be added to a customer’s order with just one-click. This increases conversions because they don’t have to enter their payment information again. If you’re confused on how to introduce a one-click upsell to your course, use a shopping cart platform like SamCart. SamCart makes it easy to setup one-click upsells. Also, you could use ClickFunnels. With ClickFunnels, you can build your payment page and then a one-click upsell offer page that a person gets redirected to once they put in their payment information for your course. Simple point is this: you NEED upsells if you want to maximize the profits of your course. A done-for-you option so your subscribers can achieve the results faster. A 1:1 coaching or consulting option so you can hold their hand in achieving your solution. A higher priced product if you have multiple products to sell. Just make sure your upsell makes sense with the course you’re selling. A great upsell would be anything that helps a buyer get the solution done faster, get it done easier, or is just a logical next step a person would make once they have your course. So for instance, if you’re selling a course on shooting great photos, the next step would be learning how to edit those photos (shoutout to one of my clients for this incredible upsell). So you might be thinking … what happens if people don’t buy from your Launch Sequence? By this point, they’ve seen your webinar, they’ve seen your pre-launch content, and they’ve engaged with your launch, but they still didn’t buy! How can you follow-up with these people? Easy. You create a follow-up system. I’ve seen many businesses stop their marketing after leads pass through the launch sequence, and never engage these leads again. With a follow-up system, you’ll score more customers for your course, and gain some neat insight on why they didn’t buy earlier. While you can launch your evergreen course funnel without this part installed yet, it would be a great idea to understand how you’re going to follow-up with your leads, and potentially maximize your ROI from those leads. So let me break down the different follow-up campaigns! A Daily Email Campaign (or Long-Term Nurture Campaign) is a consistent series of emails sent to your subscriber with the goal of keeping your product at the top of their mind. With these emails, you can either send them every day (like some marketers online do) or send them 2-3 times a week. Provide value in the form of new content (blogs, podcasts, resources around the web). Be entertaining and engage your subscribers with stories. If you’re providing value, I recommend sending less emails. Otherwise, you’ll burnout on content. If you’re just being entertaining, then you can go the daily email route. What makes these emails effective is their call-to-action (CTA). Each email will have a CTA at the end. And guess what these CTAs will point to? That’s right … buying your course! If they buy during this phase, I usually recommend excluding bonuses from their offer. Meaning, if they buy during the webinar and launch phase, they could’ve had bonuses included with the offer, making the urgency greater during that period. By having the course be in front of people during the follow-up, you’re letting your subscribers know that you still have a solution available for them. A Sales Call Campaign is simple. Basically, if a person didn’t buy from the webinar or launch sequence, we can assume it’s because they needed to talk with someone first. If you’re comfortable getting on the phone with leads, then here’s how to execute this sequence: just send a couple emails pushing people to apply for a time to talk with you. Don’t just give people a link to schedule a call with you. Have them fill out an application. Here’s why … you need to know about their business and why they haven’t bought from you in the first place. This will make your call your productive as you’ll already have a picture of their readiness to buy. This 5 email sequence for a sales call is crazy effective. Just remember to have your CTAs lead to your application. If they pass through this sequence and don’t apply for a call, market to them with weekly broadcast emails. Sending a campaign giving people lead magnets that trigger other course funnels. If you have another automated webinar to another course, pitch those. By the end of this campaign, the hope is your subscribers will place themselves into another pitch. That’s it. That’s how you build an evergreen course funnel to sell your online course 24/7. You’ll do a live product launch of your course, which includes your 3 videos, your live webinar (which you should do for your live launch), and all your sales copy. You’ll re-record the webinar you used in your live launch. You’ll automate your webinar recording, paying attention to things like your event frequency, your show-up emails, and your segmentation. You’ll write any remainder emails you have for your funnel. You’ll automate your email delivery so it sends to the right people. You’ll make sure your upsell is running. You’ll execute a follow-up system. With all of these actions, you’ll have an UNSTOPPABLE evergreen course funnel. With an evergreen course funnel, you could have this continual revenue supplement big open and close cart launches. But I recommend, if you choose to go this route, to do an open and close cart product launch on another higher-priced product than the one in your evergreen course funnel. I know I just hit you with a TON of information. I don’t know about you, but whenever I come across a massive load of information like this, I get stunned and don’t know what to focus on first! The best place to start is with my 24/7 marketing system to acquire clients and sell more courses. You can download it below. [thrive_2step id=’1427′]Click here[/thrive_2step] if you want my FREE guide on how I’m able to acquire clients AND sell courses with one single marketing system. This article is AWESOME Neal! Thank you so much for spending time to create it. I love your step-by-step approach to making creating course funnels a simple and straight-forward process. I already have my sales funnel in place, but I think I’ll now be tweaking it using your strategies! Thanks Laurel! Let me know if you need help with it. You could probably REALLY benefit if you had your lead magnet as an automated webinar, and send your 3 videos to people if they don’t watch the whole webinar OR leave the webinar early. This blog post is great!. Do you have any other blog post where you go more in details on what to put in the emails? And for a live product launch? Thank you! Sounds scary to set this up, but will give it a try!